Because dice are a central part of the game, Star Wars™: Destiny is often assumed to be heavily chance-based. Many gamers have a bias against dice-based games, claiming that they involve too much randomness, or that games are too often won or lost based on luck more than skill. 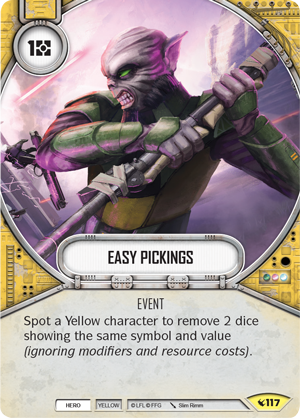 Despite the focus on dice, Star Wars: Destiny has many mechanisms that allow skilled players to mitigate the effects of dice rolls and get a much more consistent performance out of their deck. In fact, as developer Aaron Haltom shares below, Star Wars: Destiny can actually be less luck-dependent than many other games. For more information, just read on! Most card games use the shuffling of cards as their primary randomization mechanic, putting a strong emphasis on what you draw over the course of a game. In games where you must draw resources before you can play your cards, for instance, your game can be won or lost practically at the opening hand: too few resources and your opponent will outpace you; too many resources and you are likely to run out of steam in the mid-game and have your opponent overtake you. Star Wars: Destiny, by contrast, greatly reduces the element of chance in the distribution of resources. Each player simply gains two resources every round. This base level of resource income ensures that both players can make meaningful plays immediately, without having to rely on chance to get their economy started. 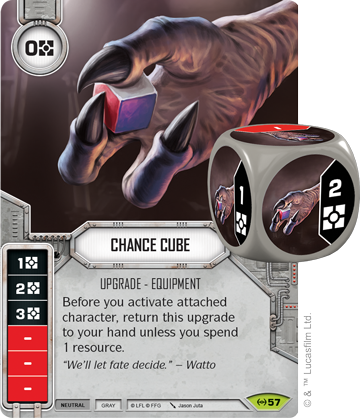 If you want more resources per round, which many decks do, you can further supplement your income with resource-generating cards and resource sides on your dice. 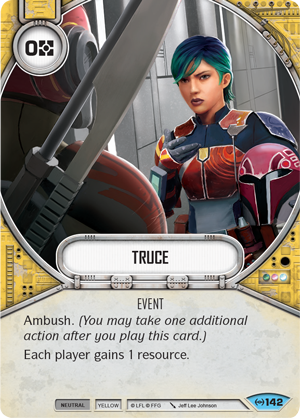 Cards that generate resources like Truce (Empire at War, 142) and Enrage (Awakenings, 81) are very popular because they can get you that extra resource without relying on dice rolls at all. 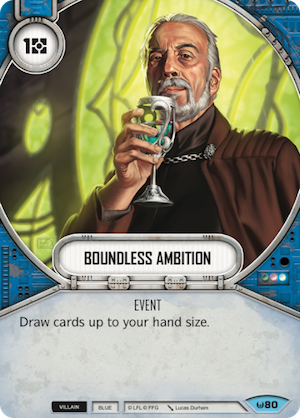 Because of the guaranteed two resources per round in Star Wars: Destiny, players all start on an equal economic footing, and this softens the impact of variance. There's less emphasis on whether you were lucky enough to draw a good resource mix and more emphasis on whether you can make wise decisions with the resources you do have. In card games, the randomization of your deck is important, not just for getting enough resources to play the game, but for drawing the key cards you need to pull together a strategy. It's hard to build a deck around a particular card, because your chances of winning will hinge on whether you draw that one card soon enough. It is harder still to pull together a combo deck that needs multiple key cards to complete the combo. Since many card games use decks in the range of 40-60 cards and only let you draw one to two cards a round, it takes far too long to wait and hope to draw your key cards. Instead, you must rely on luck to draw them in your opening hand and/or use cards that help you draw or search your deck to track down the pieces you need. 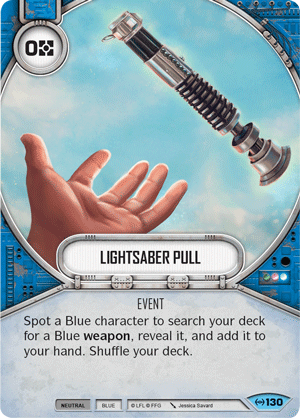 In Star Wars: Destiny the draw aspect is much less of an impediment to getting your deck functioning. First of all, because Destiny lets you start with your characters (and your plot, if applicable) in play, you can count on those abilities immediately rather than hoping to draw into them. This gives a solid foundation for your deck to build on. 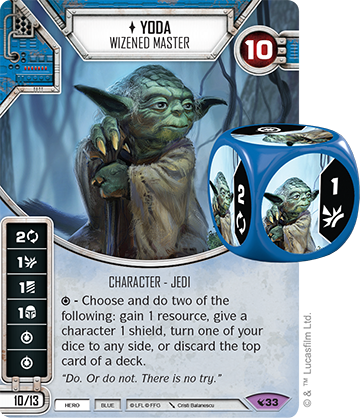 Star Wars: Destiny is also unusual for a card game in that it uses a deck of just 30 cards, and lets you draw up to five cards a round to refill your hand. Because of the small deck and the large amount of card draw, you usually see a good percentage of your deck, and it's not uncommon for you to actually draw your entire deck. This means that your ability to find key cards and to pull together specific combos is inherently improved in Destiny. For the same reason, card draw and search effects tend to be much cheaper, which further increases your ability to draw what you want to get a specific strategy going. The flip side of going through your deck so quickly, of course, is that you run much more risk of running out of cards completely and losing the game. In most card games, your deck feels like a warehouse that can store a lot of goodies, but you can only have access to a small amount of your goods at once. 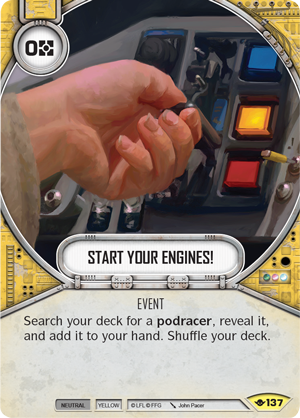 In Star Wars: Destiny, your deck feels more like a tool belt, where you have fairly easy access to any of your tools, but you have less total storage and you have to make hard decisions about exactly what you're willing to carry with you all the time. 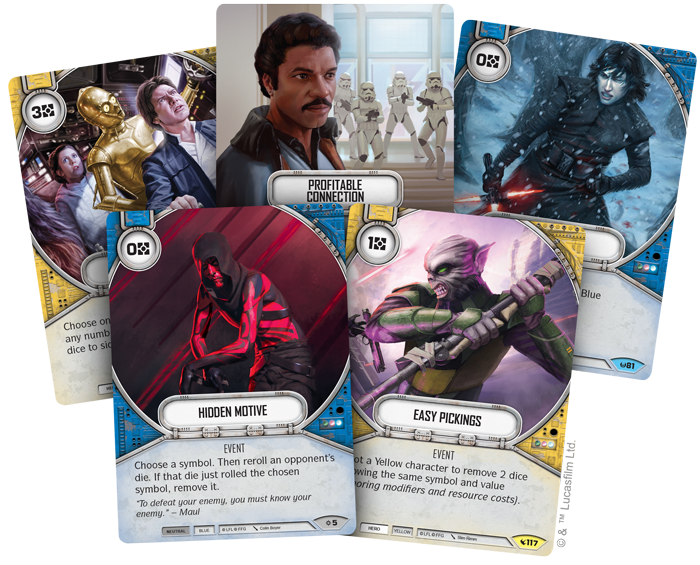 By now it should be clear that Star Wars: Destiny is surprisingly consistent in terms of your ability to pull together the combos you want and get the resources to actually play them. But, of course, Destiny is a dice game, and the element of chance is still important. After you have selected your team, drawn your key cards, and played them, your victory or defeat can still hinge upon your dice rolls. But Star Wars: Destiny is no more or less chance-dependent than most card games. It simply shifts the element of chance away from basic things like getting your team set up and gathering resources, and more toward the exciting part—combat! 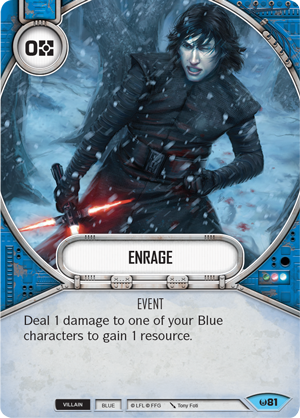 Cards that do direct damage are very rare in Star Wars: Destiny, and we keep them intentionally inefficient. Generally, the path to victory in Destiny entails rolling lots of damage on your dice. This means that even when you are far behind in the game, you still can hold onto the hope that your opponent might fail to roll damage long enough for you to roll all the damage you need. Yet the element of skill is still crucial, because the larger the gap gets, the more outlandish your odds become. 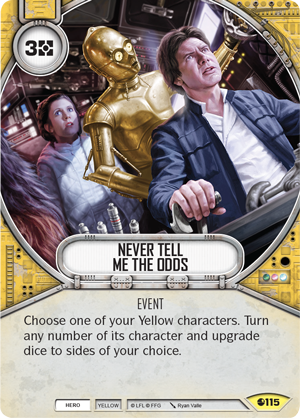 You have a 1 in 6 chance of rolling a blank on your average Star Wars: Destiny die, but your chance of rolling all blanks on two dice is only 1 in 36. On three dice that chance goes down to 1 in 216. If you can get eight dice out on the board, the chance that all of them will roll blanks dwindles to a minuscule 1 in 2,177,280. On the other hand, the same math applies if you are trying to roll the very best side on each of your dice. The larger the dice pool gets, the more your rolls will tend to average out and the less truly random the game will feel. Because you often end up taking a middle-of-the-road die result, it is important to evaluate characters for the consistent strength of their dice, rather than being tempted by a die that just has one big, splashy side. 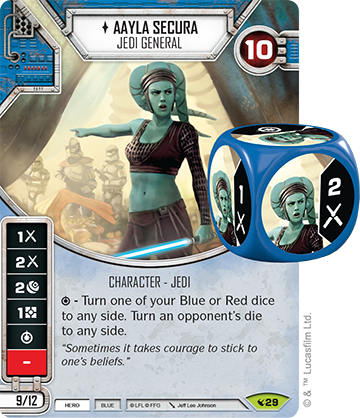 There is a reason that so many top players gravitate toward well-rounded characters like Aayla Secura (Legacies, 20) with five great sides, or better yet, a character like Yoda (Legacies, 33), who has no blanks at all! The random nature of the dice is also heavily mitigated by many aspects of the game. First and foremost, you can discard any card to reroll any number of dice, giving you many chances to change your fate. Secondly, many dice also have focus sides, which let you turn a die to the side of your choice. Many cards let you bypass chance entirely and just turn your dice, e.g. Never Tell Me the Odds (Spirit of Rebellion, 115). 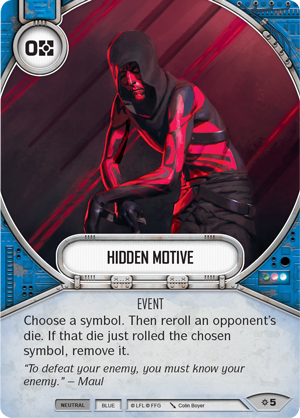 You can also use cards to deal with your opponent’s scary die sides—soft mitigation cards like Hidden Motive (Rivals, 5) let you reroll dice, while removal cards like Easy Pickings (Legacies, 117) just knock those problem dice out of the pool entirely. The best players know how to play the numbers. While it might be easy to blame the dice for every loss, a truly great player will instead look back on the game and try to figure out if there was anything they could have done to better increase their odds. A true champion takes their destiny into their own hands! Happy shuffling, and may the best player win!